There are many places in GIMP where you can find menus. The aim of this chapter is to explain all the commands that are accessible from the image menu bar and the image menu you can get by right clicking in the canvas. All the context menus and the menu entries for the other dialogs are described elsewhere in the chapters that describe the dialogs themselves. This menu bar may contain other entries if you have added script-fus, python-fus or videos to your GIMP. Clicking on an image window displays the Image menu. This is useful when you are working in full-screen mode, without a menubar. Clicking on a layer in the Layers Dialog or on a channel in the Channels Dialog displays functions for the selected layer or channel. Right-clicking on the image menubar has the same effect as left-clicking. Right-clicking on the title bar displays functions which do not belong to GIMP, but to the window manager program on your computer. There is an interesting property associated with some of the menus in GIMP. These are any of the menus from the Image context menu you get by right-clicking on the canvas and any of its submenus. (You can tell that a menu item leads to a submenu because there is an icon next to it.) When you bring up any of these menus, there is a dotted line at the top of it (tear-off line). By clicking on this dotted line, you detach the menu under it and it becomes a separate window. Tear-off menus are actually independent. They are always visible, their functions always apply to the current image, and they persist when all of the images are closed. You can close a tear-off submenu by clicking on the dotted line again or closing the window from the window manager on your computer (often by clicking on an X icon in the upper right corner of the window). These tear-off submenus are also created in single-window mode, but are of less interest since they are masked by the window as soon as you click on it. 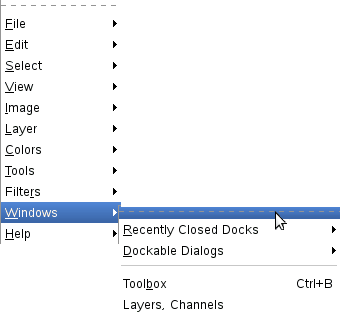 Every dockable dialog contains a Tab Menu button, as highlighted below. Pressing this Tab Menu button opens a special menu of tab-related operations, with an entry at the top that opens into the dialog's context menu. Figure 16.2. A dockable dialog. A dialog window with the Tab menu button highlighted. 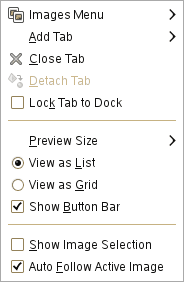 See Section 2.3.2, “Tab Menu” to learn more about Tab menus.